The Picavet rig has a long history-- developed in the 19th century for kite aerial photography and rediscovered in the 1980's. It uses a continuous loop of string through four points on a platform and 2 or 4 points above to automatically level a platform. Chris Fastie built a dual-camera Picavet rig and has a great video showing its construction and first flight. The design and instructions for building Chris's 3D printed Picavet are available at the KAPtery. 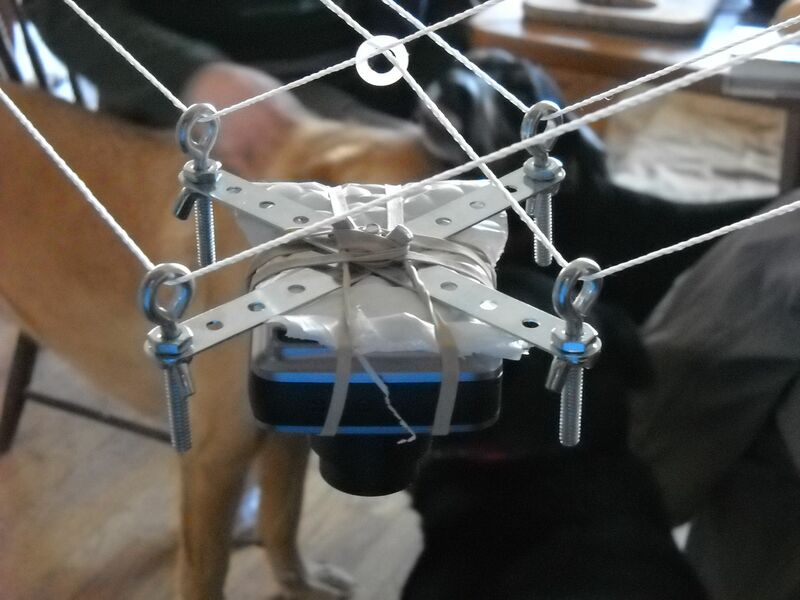 The FABA collective has made a picavet similar to Michele's trash can rig but with a few ingenious uses of rubberbands and springs. Definitely worth integrating into your kit. For those with access to laser cutters, Myles has made a laser-cut picavet rigging that mounts on a bottle top. His most ingenious innovation is the use of bike chain links as pulleys.